World of Warcraft: Legion is in testing, here i will share some information about The Titanforged Gear. World of Warcraft players recently got an eyeful of information about Titanforged items and how the game’s item levels will work through Legion. It explains how item upgrades works, walks through the process, and potentially changes every aspect of gearing in the game as well as assumptions about how players can get the best gear from content. As it stands now, people raiding on Normal have little reason to ever run a Heroic dungeon; the items it rewards are far too low-level to even touch what’s available in normal raids. In Legion, players who raid on Normal will still have a chance at upgrades from other content, giving those players more reasons to get out in the world and actually take part in content rather than logging in on Tuesday and avoiding the game for the rest of the week. The simple version of Titanforged gear and item upgrades is that item upgrades no longer follow the Warlords of Draenor model through which you might get an item upgraded by 10 levels at most. No, the new system is what tabletop veterans would call an “exploding roll.” If an item drops that would normally be item level 810, there’s a percentage chance that the item will be upgraded to 815. If it gets that upgrade, another random chance is generated for it to be updated to 820. If it gets that upgrade, another random roll can upgrade it to 825… and so on. The only limit on upgrades is a universal item level cap across all content. It’s important to emphasize, of course, that this system is a chance, not an assurance. Even at a 50% chance (and we don’t know the precise chance), it’s clear that higher-level content is still a more reliable way to get max-level items simply because there are fewer chances to fail. If you’re in content that drops level 880 gear, your odds of getting a piece at the global cap of 895 with a 50% upgrade rate is 12.5%; if your content rewards 840 gear, you’ve got around a 0.02% shot. You are going to have a hard time reliably building a set with those odds. This is a huge and significant departure from the way that World of Warcraft has heretofore handled gearing. Previously, items that drop from a given sort of content always drop at a given item level, with the more accessible content providing universally lower rewards. Now, even just clearing a world quest has the potential to reward an item at the highest possible level of content. More data are obviously needed to know exactly how this will affect gearing in the long run, and the lack of any sort of token-buying system will still slow gear acquisition somewhat. A chestpiece might be upgraded to 895 in a lucky drop, but that doesn’t help much if it’s a plate chest and you’re on Demon Hunter. 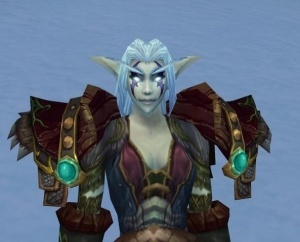 Still, it’s a major shift to the way that gearing in WoW has traditionally worked, and it’s going to change the dynamics of the game significantly. Before, you knew that someone with a few pieces of extremely high-level gear had been pulled along into a raid with friends.